It’s already been too long.… After retiring from his talk show a few years ago, Larry King is planning to make a digital comeback in our lives. Did you miss those iconic suspenders gracing your periphery? 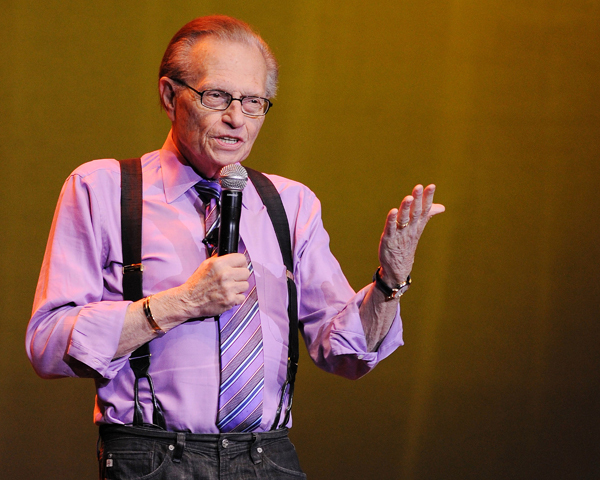 Well, fear not, because you may see Larry King back in the talk show world very soon. According to reports, the richest man in the whole wide world — Carlos Slim, Mexican magnate and telecommunications billionaire — is launching a new digital television network, gloriously entitled Ora.TV, “that will create high-quality video programming for digital distribution via a variety of platforms, such that it is seamlessly available on phones, laptops, tablets, connected televisions, and other devices.” By design, the network programs will uphold the same standards as regular television equivalents, but — drum roll, please — all of the content is going to be on-demand! So, here’s le scoop important: Larry King will start up a new daily talk show on the Ora network and consequently is going to reintegrate himself into our hollow lives. Applause, please. We all remember that King retired in 2010, after hosting Larry King Live on CNN for 25 years, thus leaving a bloody gash in our television-watching rituals. But soon, we may have the ability to behold his 78-year-old face again… on demand. Glory to Almighty Zeus! Of course, surely there’s more to the Ora.TV network than just Larry King, but there is no additional programming information available yet. The network is set to launch sometime in 2012.